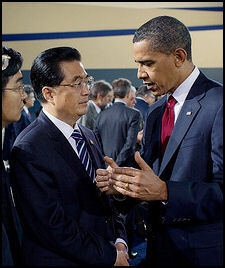 Hu with ObamaThe 17th Party Congress was held in mid October 2007. 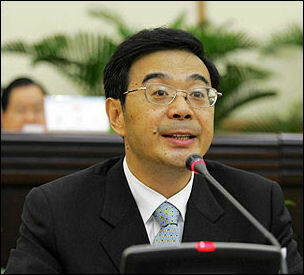 As expected Hu Jintao reshuffled the Chinese leadership, promoted rising stars and hinted at possible successors. A number of high level officials were replaced going into the meeting. Hu Jintao was shown chatting with Jiang Zemin to give the appearance of party unity. Rumors about what was going on behind scenes were flying especially fast and furiously. Among the noteworthy events were the high number of princelings, including Xi Jinping (See Separate Article), that rose to positions of significant power. The Congress was seen as a test of Hu’s political skills and seen as a forum to define teh direction he would take during his second five year term.The Congress endorsed his second term as president and reappointed him to his other leadership positions and gave him more authority to carry out his agenda. The nine Standing Committee members after the congress were: 1) President Hu Jintao, 64; 2)Parliament Chief Wu Bangguo, 65; 3) Prime Minister Wen Jibao, 65; 4) Top Advisor to the Parliament Jia Qinglin, 67; 5) Publicity Chief Li Changchun, 63;6) Shanghai Party Boss Xi Jinping, 54; 7) Liaoning Party Boss Li Keqiang, 52; 8) Head of Party Organization He Guoqiang, 64; and 9) Public Security Minister Zhou Yongkang, 64. Chinese Vice President Zeng Qinghong, a close ally of Jiang Zemin and regarded as a rival of Hu Jintao, gave up his seats on the Central Committee and Politburo. Other leaders associated with Jiang Zemin were given a reduced role but others kept their positions in the Standing Committee and Politburo. No doubt they kept their positions by acknowledging their support of Hu. 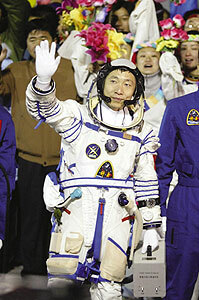 first man in space Some have asserted that China’s rise debunks the 1989 thesis of Francis Fukuyama that the fall of the Soviet Union and the Eastern Bloc was “The End of History.” Some have gone as far as to say that China’s rise is ushering in a New Age of Authoritarianism in which Chinese authoritarianism will offer a model that developing countries will chose instead of liberal democracy. China celebrated the 60th anniversary of its founding with great fanfare in October 2009. The largest military parade in more than a decade showed off weapons such as the upgraded nuclear-tipped DF-31 missiles capable of reaching the United States and domestically-produced J-10 jet fighters. More than 100,000 marched in the parade before Hu Jintao and other Chinese leaders dressed in Mao suits. Almost as notable as the celebration itself were the security measures that were taken. Foreign tourists were barred from Tibet, blocks on sensitive websites increased. Even kite flying was banned as a precaution against areal attacks. A major meeting of the National People’s Congress, China’s quasi-legislature, was held in Beijing in March 2011 The nearly 3,000 party members that attended congress approved a Five-Year Plan after 10 days of meetings. The Congress was held as President Hu Jintao and other party leaders prepare to hand over power next year to a younger generation. They are trying to ensure a smooth transition while leaders maneuver furiously in private to secure top posts for younger allies. The official China News Service said Beijing had mobil ized 739,000 police officers, officials, security guards and volunteers to maintain security during the event. “The annual report, like those before it, offered a sheaf of paeans to the Communist Party’s stewardship of the nation, with staggering statistics to support them. China’s international prestige “grew significantly”; its “brilliant achievements” in economics “clearly show the advantages of socialism with Chinese characteristics.” The state opened 4,986 kilometers, or 3,100 miles, or new railroads and 120,000 kilometers, or nearly 74,600 miles, of highways; completed 230,000 sports and fitness projects for rural residents; built or renovated 891 hospitals and 1,228 health clinics. The report pledges to further reduce energy consumption per unit of G.D.P. by 16 percent, and carbon dioxide emissions per unit by 17 percent. And for the first time, the state-run Xinhua news agency reported, the government will place a cap on total energy use, limiting consumption to the equivalent of four billion tons of coal by 2015. In July 2011, the Chinese Communist Party celebrated its 90th anniversary. In a speech President Hu Jintao said China's ruling communist party must ensure economic growth and its iron grip on stability do not slacken. "Development is of paramount importance and stability is the paramount task," Mr Hu told hand-picked party members inside Beijing's cavernous Great Hall of the People, in a speech carried live on state television. "Without stability, nothing can be accomplished, and the achievements that we have made will be lost. All of the party's comrade's must take this message to heart, and they must also lead all the people to take this to heart...Only by promoting both healthy and fast economic development can we secure a strong material foundation for the great revival of the Chinese nation." Since the autumn of 2009, following the Fourth Plenary Session of the 17th Central Committee, China and the world have witnessed a more repressive and insecure Communist Party, including a slowing of some political reforms undertaken from 1997-2009. Despite the political stagnation, three sets of reforms have continued: expanding multi-candidate elections to local level party committees; increased transparency in local budgeting and resource allocation; and efforts to improve meritocracy at all levels of the party and government. But efforts to make central policy making more transparent, to prosecute pervasive corruption, to improve “intra-party democracy” and “extra-party supervision,” and to open up the media have all stagnated. These reforms all grew out of the party’s study of the collapse of the Soviet Union and other one-party regimes. The main lesson the Chinese Communist Party drew from these foreign examples was to be proactive, flexible and adaptive, and to manage political change from above. Stasis and dogmatism were seen as recipes for stagnation and collapse. What we are witnessing as the party turns 90, however, is the opposite. Instead of being secure and confident, it is seemingly frozen in fear of the future, unsure about its grip over ethnic regions (Tibet, Xinjiang, and Inner Mongolia), afraid of rising social unrest and ad hoc demonstrations, worried about the macro-economy and foreign relations, and on the cusp of a major leadership transition in 2012. Moreover, a coalition of internal security forces, giant state-owned corporations, the propaganda apparatus, and the military have joined with hard-line elements in the party to pull back from reforms. Yet there is a reformist wing in the party, led by Prime Minister Wen Jiabao, which advocates more open politics. But it does not have the resources or allies to re-ignite political reforms. The intra-party cleavage runs high and deep and party members here indicate viewpoints and factions are becoming increasingly polarized. The pending leadership transition only adds to the risk aversion and crackdown. China’s Communist Party at 90 is a bit like many 90-year-olds: increasingly infirm, fearful, experimenting with ways to prolong life, but overwhelmed by the complexities of managing it. Fifth-generation stalwart Li Yuanchao, a politburo member who is in charge of high-level personnel matters, is a tuanpai affiliate and crony of the president. Zhang Ming, a professor at Renmin University in Beijing, said Li, who is head of the party's powerful Organisation Department, which appoints and controls personnel at every level of government and industry, may get one of the coveted positions. Considered an open-minded official, he studied briefly at the Harvard Kennedy School of Government and his tenure as party chief of the eastern province of Jiangsu was widely seen as a success. Liu Yandong resides on the politburo as state councilor. Zeng Qinghong is a former vice president and highly-regarded political fixer.